Pre-game Ep1: "The Marooning" Ep2: "The Generation Gap"
The Marooning: Tribes have two minutes to gather items they might need, then jump off a ship and paddle a raft to their beach. Tagi arrives 2 hours later, Pagong 3 hours. 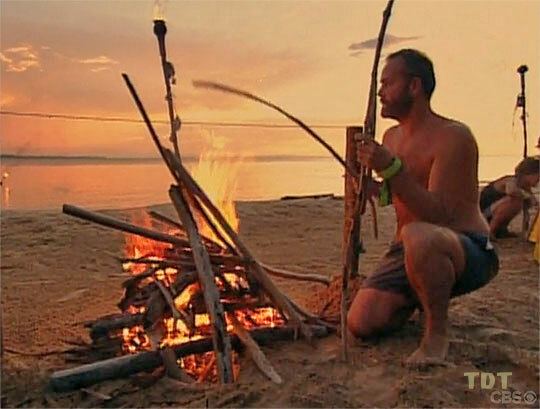 Starting at a buoy, all tribe members must hold on to a raft carrying a flaming wok, as the move the raft to and up the beach, lighting a series of torches. First tribe to light all the torches and the big structure at the end wins. 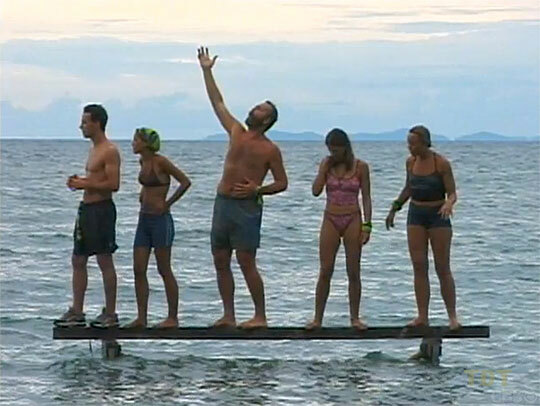 Pagong narrowly wins immunity plus 50 waterproof matches. 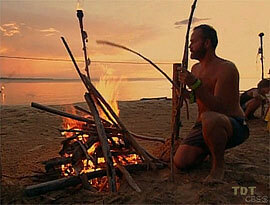 Ep1 RC/IC: "Quest for Fire" - Pagong wins immunity and matches. TC1 - Sonja voted off (4-3-1), 15 left. Each contestant must eat butok (a live beetle larva). All do. For the tiebreaker, Tagi selects Gervase and Pagong selects Stacey to race to eat two larvae. Stacey wins, giving Tagi immunity. Ep2 IC: "Buggin' Out" - Tagi wins. TC2 - B.B. voted off (6-2), 14 left. Ep3: "Quest for Food" Ep4: "Too Little, Too Late?" 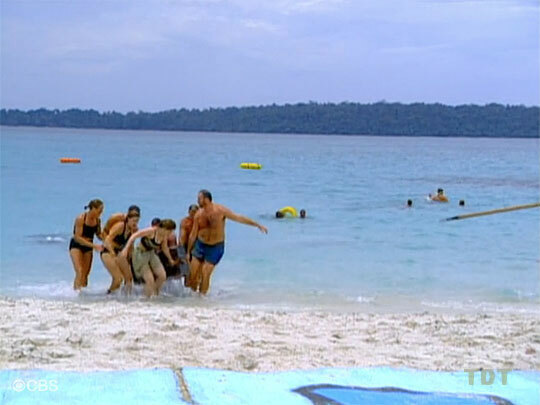 Ep5: "Pulling Your Own Weight"
All tribe members must swim out to a buoy, then dive down and haul treasure chest through the water and up onto a platform on the beach. Tagi wins, and opening the chest reveals the reward is fishing gear. Ep3 RC: "In From the Deep" - Tagi wins fishing gear. Each tribe has one member (Kelly, Colleen) representing a parachuter suspended from a tree in the jungle. Tribemates must run through the jungle to their 'rescuee,' put them on a stretcher, then carry them back to the beach. Pagong wins. Ep3 IC: "Rescue Mission" - Pagong wins. TC3 - Stacey voted off (5-2), 13 left. Tribes send Dirk and Jenna as representatives to meet with Probst about the reward, and request additional items. Tribes have two hours (after sunrise) to create a distress signal visible from a plane. 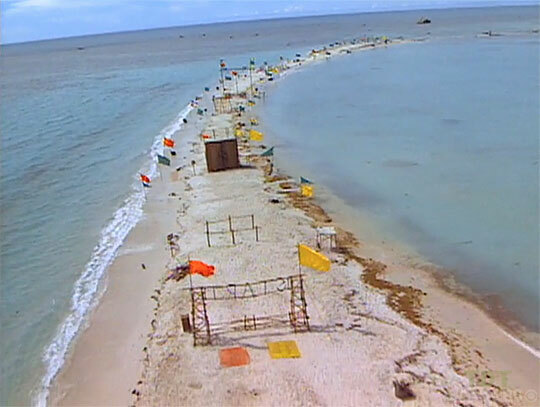 Probst flies over both camps, and decides Tagi's use of the cal-yellow rain jackets (and movement) gives Tagi the edge. Tagi gets a crate of Target items, including towels, toilet paper, spices, and a filet knife. Ramona sits out. 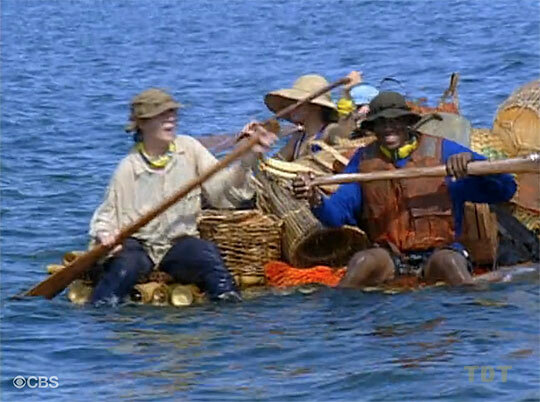 For each tribe, one person (Sean, Colleen) must swim out to a buoy, to retrieve a bottle. 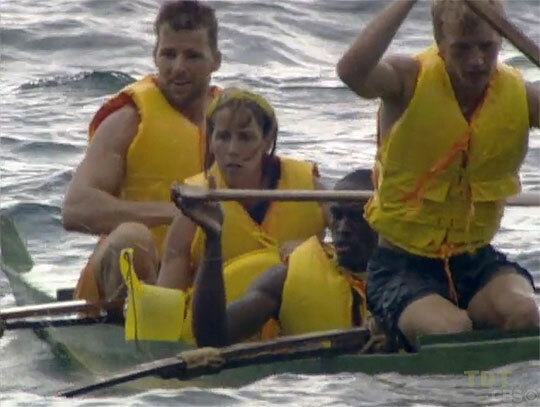 They hand it off to a second person (Kelly, Greg) who races across a floating bridge to a boat, where they join a third person (Sue, Joel) and row a boat back to shore. On shore, the bottle contains a map for the location of a key, which one person (Dirk, Gervase) must run through the jungle to retrieve. The final two people (Rudy, Richard/Jenna, Gretchen) must use the map to dig up a treasure chest. Both key runners get back before the chests are dug up, and Tagi wins. Ep4 IC: "Buried Treasure" - Tagi wins. For no apparent reason, Probst personally nails the RC treemail to a tree in each camp, hand-delivers weapons with which the tribes are allowed to practice, and awkwardly explains the challenge. Hilarity ensues. 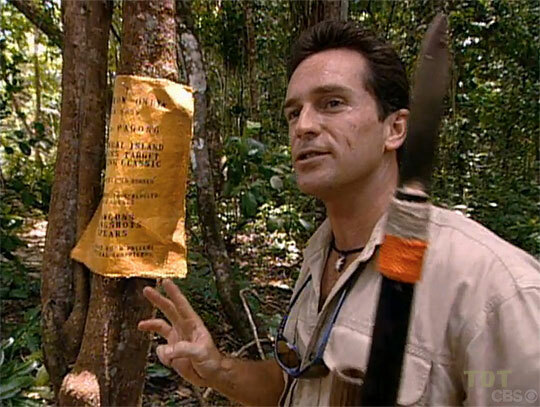 Probst comes to camp to announce tomorrow's RC. Ep5: "Pulling Your Own Weight" Ep6: "Udder Revenge" Ep7: "The Merger"
Rudy, Kelly, Dirk, Colleen, Gervase, Greg sit out. First round: blowdarts. Sean and Jenna blow darts into fruit. All hit fruit goes into the reward basket. Second round: slingshots. Hatch and Gretchen break vases holding fruit. All fruit thus liberated goes into the basket. Final round: spears. Joel and Sue take turns tossing spears, closest to the center wins the whole reward. Joel wins. Pagong gets all the fruit, plus three chickens. Gervase and Kelly paddle outrigger canoes for their tribes. They must paddle out, around a buoy, then 'rescue' their remaining 5 tribemates on the way back to shore. Despite Kelly's extensive experience, Gervase and Pagong easily beat Tagi. 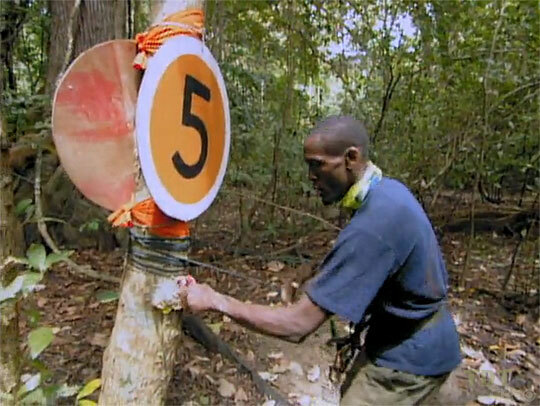 Ep5 IC: "Shipwrecked" - Pagong wins. TC5 - Dirk voted off (4-1-1), 11 left. Colleen, Greg, Joel, Kelly, Rudy sit out. One at a time, contestants must race into an abandoned 'barracks' and retrieve one of three items (helmet, knife, can opener). Returning a duplicate item results in disqualification. Sean, Jenna get helmets; Sue gets a knife, Gervase a can opener; then Hatch returns with a second knife, disqualifying Tagi. Pagong wins all items returned, plus MREs, canned food, and chocolate. Colleen, Gervase, Rudy sit out. On a Green Beret-designed course, a pair from each tribe (Joel, Jenna; Kelly, Sean) starts the course, joined at the midpoint by another pair (Greg, Gretchen; Hatch, Sue) for a bridge-crossing puzzle obstacle. 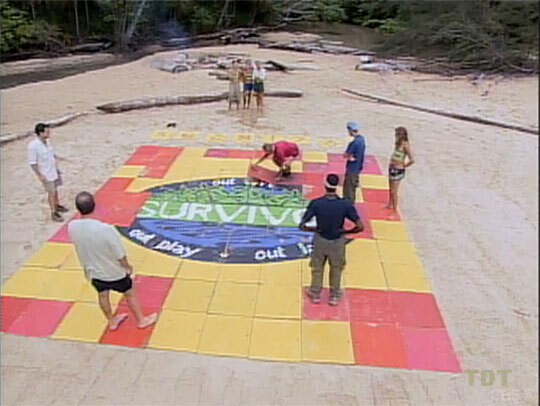 Both tribes reach the final flag-raising part at around the same time, but Tagi wins. Ep6 IC: "Obstacle Course" - Tagi wins. Jenna and Sean get the merge feast all to themselves (lobster, potatoes, wine), as they discuss the tribe name and paint a flag. In slightly over 24 hours. It pays to be an ambassador. Sean and Jenna tour camps, spend night on sand spit as ambassadors. Tribes merge. Pagong moves to Tagi beach; Rattana tribe formed. Ep7: "The Merger" Ep8: "Thy Name Is Duplicity" Ep9: "Old and New Bonds"
In the first round, contestants just hold their breath underwater. Top three times (3.Sean, 2.Greg, 1.Gervase) advance. 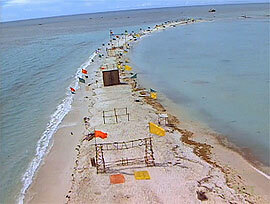 In the final round, contestants race along an underwater ladder, releasing buoys. First to the finish line wins. Sean and Greg are neck and neck, Gervase hopelessly out of it, but Greg wins. 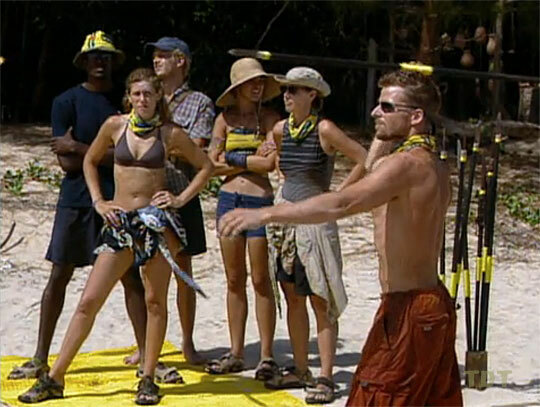 Ep7 IC: "Snake Island Relay" - Greg wins. TC7 - Gretchen voted off (4-1-1-1-1-1-1), 9 left. 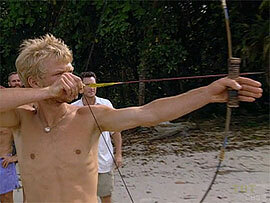 In one of the lamest challenges ever, each contestant gets to shoot one arrow at a target, closest to the center wins. That would be Greg, who gets to see his entire video from home, and film one to send back to his sister. Kelly, Sue, Gervase, Hatch, and Jenna are the next-closest. Colleen, Rudy, and Sean all miss the target. Ep8 RC: "Survivor Archery" - Greg wins video from home. Contestants must race to the end of a ropes course, picking up a colored carabiner at each of five checkpoints along the way. Gervase wins, Jenna second, Sean third. Greg probably fourth, and the rest unclear. Ep8 IC: "End of the Line" - Gervase wins. TC8 - Greg voted off (6-3), 8 left. Contestants must must collect 12 medallions from various places along a ropes course, then return to the podium in the center. Colleen and Kelly are 1st/2nd for most of the challenge, but Colleen wins. (Jenna 3rd, Gervase 4th, Rudy 5th?) Colleen gets barbecue and letters from home, brings Jenna with her. Ep9 RC: "Out on a Limb" - Colleen wins barbecue and letters from home, brings Jenna. Starting on identical squares in a red 10x10 grid, contestants must move to an adjacent square, turning over the square they left, until no red squares are adjacent. 8.Colleen out first, then 7.Kelly, 6.Sue, 5.Jenna, 4.Rich, 3.Gervase, 2.Sean, 1.Rudy wins! Ep9 IC: "Squared Off" - Rudy wins. TC9 - Jenna voted off (4-3-1), 7 left. Ep10: "Crack in the Alliance" Ep11: "Long Hard Days" Ep12: "Death of an Alliance"
Gervase learns of his son's birth. Just a series of balance beams over water. First round: first four to cross advance (Sue, Hatch, Sean, Gervase). Second round: First two (Hatch, Gervase) advance. Final round: Gervase wins, gets one slice of pizza delivered by helicopter (gives a bite to all), phone call home the next morning. Ep10 RC: "Bamboozled" - Gervase wins. Contestants have three minutes to collect driftwood and build a fire base. Then, after a second starting signal from Probst, they race with their torch into the water, light the torch from a floating wok, then bring it back to shore. They must then use a piece of wood from the fire to transfer fire from the torch to their assembled tinder pile, and get their fire to burn through a string, releasing a flag. Gervase can't keep his torch lit, and finishes last. 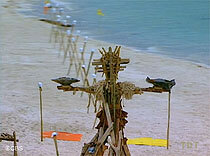 Hatch wins immunity. TC10 - Gervase voted off (5-2), 6 left. Contestants use cubes to answer trivia questions. 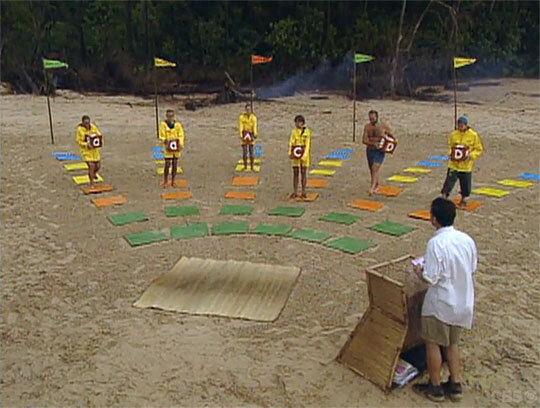 Correct answers allow the contestants to move forward on colored mats, and are eliminated if they're left behind on a color that others have left. Elimination order: 6.Kelly, 5.Sue, 4,3 (tie) Rudy and Colleen, as Rich and Sean advance to the final question. Sean wins, Hatch is second. Sean gets an overnight stay on a yacht, but not until the next day. Sean finally gets his yacht trip. After eating and getting a shower and a massage, Probst has him meet the 'captain,' who happens to be Sean's dad. They hang out together, drinking that night. The next morning, Hatch joins them for breakfast, then all return to camp, and Sean's dad brings care packages from home for everyone. 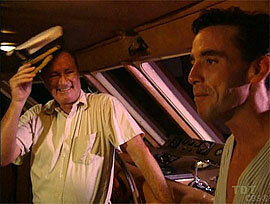 Sean finally gets his yacht night, his dad is there. 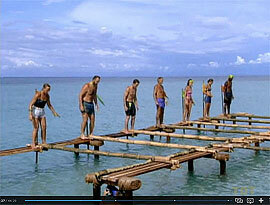 Contestants must stand on a set of planks over the water. After various periods of time, Probst wades in and removes a plank. Elimination order: 6.Rudy out first to escape Hatch's singing (1:30); 5.Hatch, 4.Sean (2hrs), 3.Sue, 2.Colleen (2:54), 1.Kelly wins. 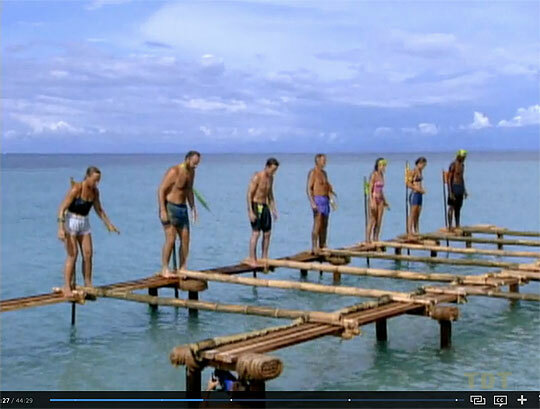 Ep11 IC: "Walk the Plank" - Kelly wins. Contestants go to Pagong's mud volcano, have 10 minutes to cover themselves with mud, transport it back to the starting line on their bodies, and empty it into a bucket. Whoever ends up with the most mud wins. Results: 1.Kelly (15.9 lbs), 2.Sean (15.4), 3.Sue (15.0), 4.Hatch (12.8), 5.Rudy (10.0). That night, a boat takes Kelly to her reward: a blindfolded arrival at a 'Survivor bar,' where she and Probst drink Bud Light, eat pasta, and watch the first 5 minutes of Episode 1. Shameless ripoff of The Blair Witch Project, which was the style at the time. 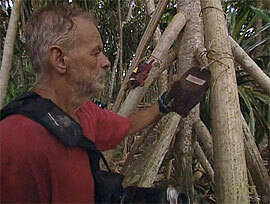 Probst tells five stories. The contestants must run into the jungle to each of five stations with masks, read the question on each mask, and record their answer on a handheld camcorder. First to return with the five masks and correct answers wins. Kelly is first (and correct), followed by Sean and Rich, Sue lags behind, and Rudy answers every question with 'I dunno.' Kelly wins. Ep12 IC: "Witch Hunt" - Kelly wins. TC12 - Sean voted off, 4 left. Held at Tribal Council, in front of the jury. Probst asks the contestants a series of questions about booted castaways, most correct answers wins. Final score: 4.Hatch (4 right), 3.Rudy (5), Sue and Kelly have 7, face off in a tie-breaker ('What is Sonja's last name?') Kelly wins. Ep13 F4 IC: "Fallen Comrades" - Kelly wins. TC13 - Sue voted off, 3 left. Hold onto the statue with at least one hand as long as you can. At 2 hrs, Probst tempts with cal-orange slices, but gets no takers. Hatch drops out at 2 hours, 30 minutes. 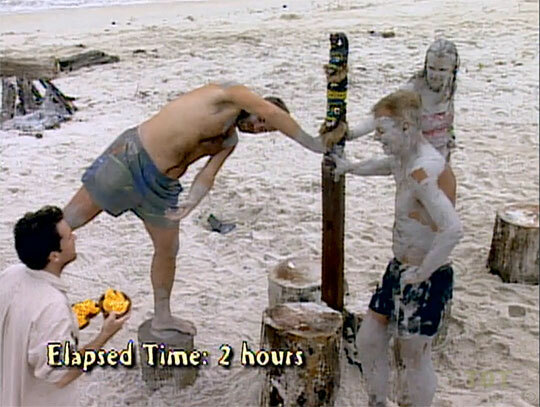 Shortly thereafter, Probst decides Kelly and Rudy should rotate positions (while still holding the statue) every 30 minutes. At the 4 hrs, 11 minute mark, Rudy absent-mindedly lets go of the statue while moving to the next position, and Kelly wins. Ep13 F3 IC: "Hands on a Hard Idol" - Kelly wins. TC14 - Rudy voted off, 2 left. Gervase asks what they'd change, Colleen asks what traits they used, Sean finds a homophobic slur hilarious, Jenna asks who'd replace them, Rudy bemoans his IC mistake, Greg asks to pick a number, and Sue takes center stage to lecture about rats and snakes. Hatch wins, 4-3, and the vote is read immediately.